Need help on all things about repairing leaking roofs? Welcome to the roof repairs help page where you will find the answers to the most common questions and problems associated with leaking roofs that are not only relevant to Sydney – but are common to most Australian roofs. There is a lot of roofing information spread out over this website. This page justifies its existence by providing answers to a list of common questions. Is Colorbond cheaper than tiles? Is a Colorbond metal roof better than a tiled roof? Why Colorbond and what is it? Why are there different roof profiles? What are the slope requirements for metal roofs? Use of Colorbond roofs near the sea? Where can I buy roofing materials? Where do I get a replacement roof tile in Sydney? What is the difference between terracotta and concrete roof tiles? How long does a tile roof last? What are fretting roof tiles? What is bedding and pointing on a tile roof? What is the difference between an eaves gutter and a box gutter? What is the best material for guttering and downpipes? Does painting make my roof last longer? Do you clean and paint roofs? Colorbond corrugated roof sheets cost me about $16 a square metre and terracotta roof tiles are about $26 a square metre to get from the manufacturers. You would think that a colorbond roof should be cheaper than a tile roof then? Tile roofs are usually a little bit cheaper than a colorbond roof to put up. Colorbond roofs usually have a ‘blanket insulation’ layer under the roof sheeting that is used for anti-condensation and insulation purposes. This building blanket is a lot more expensive than the ‘sarking’ layer laid under roof tiles. Good metal roofers have a higher skill level than roof tilers, so they cost more to employ. Therefore, you pay a bit more for a metal roofer. A colorbond roof is a bit slower to finish off, and if there are a lot of flashings – this will add to the cost…. I have a page dedicated to roof replacement costs that you may want to go to to get a bit more information about the costs of Colorbond roofs vs tile roofs. Is a colorbond metal roof better than a tile roof? Tile roofs are more common – so people must like them. But there are times when a colorbond metal roof is the only viable option. See my blog post on problems with flat tile roofs to see why this is so. Weight: A colorbond roof is much lighter that a tiled roof. This will mean less weight stress on the roof structure and the walls – leading to less movement induced cracking. Insulation: A higher rated insulation can be laid under a colorbond roof to enhance the insulation rating of the roof cavity. Tiled roofs only get a layer of aluminium sarking. Noise: The sound of raindrops is more pronounced on a colorbond roof. Tiled roofs are relatively quieter. Cosmetic appearance: Colorbond roofs can provide a more ‘modern’ look whilst tiled roofs give that ‘traditional’ look. This is very much a personal choice. Maintenance requirements: The ridge capping on tiled roofs require repair/maintenance every 15 to 20 years. This is because the bedding and pointing will crack over time due to roof movements. This cracking can lead to water leaks. Roof tiles at the valleys do not get very firm anchoring and these can slip over time and leave a hole in the roof – causing a leak. Leaves gathering on a tiled roof will choke the drainage laps on the tiles and cause water leakage – so a tiled roof is better off without overhanging branches (dropping branches will also usually crack roof tiles). Colorbond roofs in comparison do not need the same maintenance as tiled roofs – they are virtually ‘maintenance free’. Design and construction versatility: Designers can bend and curve colorbond roofs as well as making them steep or flat. Tiled roofs are limited to certain slopes to work. It is also very difficult to curve or bend a tiled roof. You can do more with a colorbond roof. Hail protection: I have seen huge hailstones put holes in colorbond metal roofs – although this is very rare. Hailstones usually just leave dents and the roof stays water tight during hailstorms. Dents on colorbond roofs do not usually affect the life or performance of the roof. 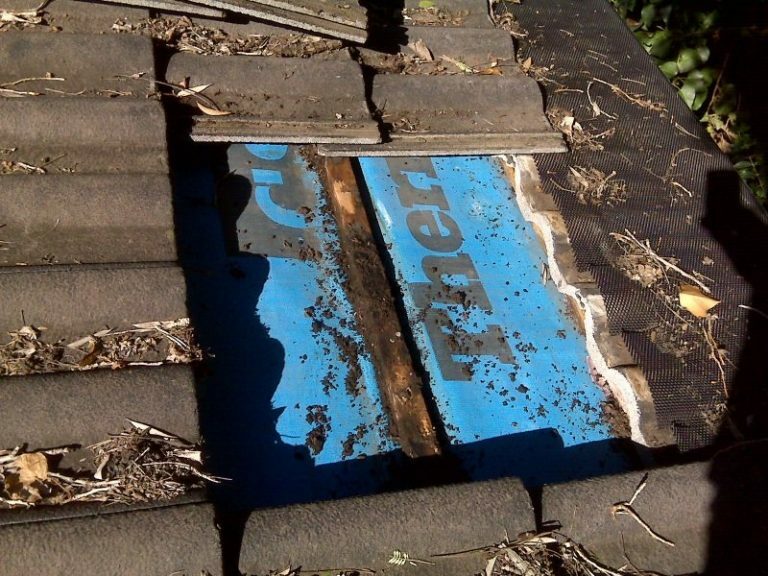 Large denting on flat roofs may cause a problem with ponding – and in this case, local replacement od roof sheets are recommended by Bluescope. Roof tiles simply crack when there is a decent hailstorm – causing large amounts of water damage to the house. Tiles offer little protection against large hail stones. Spare parts: There are numerous shapes and sizes of roof tiles and as manufacturers go out of business or decide on a new marketing campaign, tiles are phased out. So, over time, some types of roof tiles will only be available if it is taken off an existing roof. Replacing a few roof tiles can sometimes prove very difficult. Corrugated metal roofing have stayed the same since inception – so you can find a piece of corrugated roofing quite easily. Long ago, everything was galvanised to prevent rust. Then Lysaght discovered a way to protect thin sheet metal that is superior to galvanising. This is zincalume. It is a zinc and aluminium (with a bit of silicone) combined coating that is specially applied to the sheet metal to form an integrated coating that even protects the edges of the sheet metal when it is cold cut. The coating is a lot less ‘sacrificial’ and so does not wear away with time like zinc- making zincalume quite corrosion resistant. Normally, zincalume steel comes in the high strength (G550) grade with a 150 gm (zincalume) per square metre (AZ150). Colorbond is zincalume steel coated with special paints to provide a range of colours that can put that certain character into your home. Many people associate colorbond with pre-painted corrugated metal roofing. This is incorrect. Colorbond is the Australian made product that originates from the Bluescope factories in raw ‘coil’ material. These coils are then purchased by various ‘roll former’ companies (Lysaght, Metroll, Stramit, Stratco, Ace gutters. etc ) to be formed into corrugated roofing sheets, ‘Kliplok’, ‘Trimdek’, ‘Spandek’, ‘Monoclad’, ‘Speed deck’ roofing sheets…. and various guttering shapes. he most common shape (profile) of metal roofing is the corrugated one. The gentle corrugations make for an easy surface to walk on and to drain water quite efficiently. It is a low profile roof sheet – making it blend in well into the character of a house. As a roof gets flatter, the limitations of the low profile corrugations come into play. Its limited water carrying capacity leads to leaks at the laps and at the top (upstream) ends of the roof sheets. That is why there are other metal roofing profiles to cater for flat roofs. There are other profiles that are designed to allow for faster installation (for factory roof work) and for pergola roofs. Other roll formers have their own names (Monoclad, Speed deck, Hi-rib, Superdek….) for their version of the Lysaght profiles. Flat roofs need higher profile roof sheeting with wide pans to carry the slower flowing rain water. The ‘Trimdek’ metal roofing profile will work on roofs down to 2 degrees and the ‘Kliplok’ profile (which has special concealed anchoring clips) has been designed to work on roofs with an almost flat 1 degree. 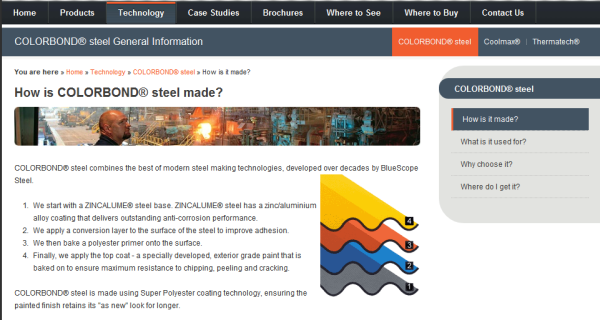 Bluescope Steel has a range of recommendations for the use of its colorbond products near the sea. Within 100m from breaking surf, the recommended product is Colorbond “STAINLESS”. From 100m to 200m, Colorbond “ULTRA” can be used. If you are more than 200m away, then you can use “ordinary” colorbond (sometimes called XRW). Colorbond “STAINLESS” is just stainless steel with a colorbond finish – so the corrosion resistance is provided by the stainless steel. It is the most expensive of the colorbond steels. Colorbond “ULTRA” has the same steel base as standard colorbond. The main difference is the grade of the zincalume coating used. “ULTRA” uses the higher grade (thicker) AZ200 zincalume – and this gives it the higher corrosion resistance, and a premium price (but still cheaper than “STAINLESS”). Flashings are custom made to suit the shape of the roof and its location. The big roll formers like Lysaght and Stramit do not retail their materials. I do not retail roofing materials because I do not have the resources to do retailing. The Roofing Professionals at Artarmon will take retails orders. Ring 02 9439 6888 . Stratco in Sydney’s west provides a retail service (they also take online orders) for all sorts of roofing, walling, guttering, garages, patios and hardware. Alternatively, youir local Bunnings carry some limited stock. Ace gutters, KFC Roofing supplies and others do retail to DIY – so you can also try them. Not turning up the upstream ends of the roof sheets. Or not doing it properly. This is a critical part of the installation process and must not be neglected. Cutting the roof sheeting with an angle grinder. A hot cut will result in rusting of the cut edge. The hot sparks from the grinding will also damage the roof sheeting. All cutting must be done by hand or mechanical shears. This method of cutting produces an edge that is automatically protected against rust. Use the correct silicone sealants (neutral cure) for flashing work. Use the correct screws (appropriate length with rubber washers). Turn down the roof sheets on flat roofs using the high profile roof sheeting. Do not place lead, stainless steel or copper flashings on top of metal roofs. Set out the first roof sheet square to the gutter with a 50mm overhang. If the following roof sheeting is laid square to the first sheet, then you will get a nice straight line for the downstream end of the roof. The last roof sheet should be cut to size so that a normal lap is made. Excessive overlapping will lead to premature corrosion between the ‘doubled up’ roof sheets. Different metals in contact with each other can result in advance corrosion problems…The most common problem with dissimilar roofing materials in Sydney is lead with zincalume steel. Traditionally, lead is the most common roofing flashing material. It is often used to cover gaps on all types of roofs – so its use as a transition flashing between different roofing materials (and between walls and roofs) is quite common. Old metal roofs were usually galvanised and there is no galvanic corrosion problem between zinc and lead – so roofers could get away with using lead everywhere on a roof. However, when the new metal roofs using zincalume and colorbond corrosion coating systems replaced the old galvanised roofs, a lot of roofers neglected to consider the danger of galvanic corrosion by using lead flashings. The result is the very common problem of premature rusting out of the zincalume (or colorbond) roofs. You can check out examples of this on my blog and many years ago, I also posted a You tube video on this. Roof cavities can contain a lot of warm moist air and on cold nights, condensation will form on the underside of a cold ( uninsulated) metal roof. Not only can condensation shorten the life of a metal roof, it can drip back onto the ceiling – causing ceiling dampness. That is why it is good practice to lay a building blanket under a metal roof. 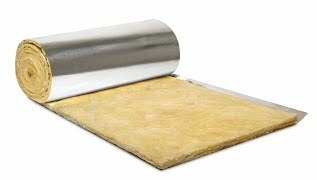 An building blanket has a moisture proof aluminium foil layer on the underside and fibreglass insulation on the top side. It has the combined effect of preventing moist air from reaching and condensing on the underside of the metal roof sheeting and also of insulating the roof cavity. Various thickness are available (with different R ratings). The most common is the 50 mm thick building blanket with a R 1.3 rating. A thicker blanket will provide a higher R rating – but the more effective way of insulating the ceiling is the use of higher rating ceiling batts – rather than higher rating building blankets. Cutting of metal roof sheeting? Metal roof sheeting should be cut by hand or mechanical shears – not by hot grinding or cutting with a disc. Hot cutting stops the zincalume coating from self healing and causes rust to form on the cut. Metal roof sheeting are custom cut to almost any length. If a roof gets too long, the roof sheeting gets to be too long and impossible to transport and handle on site. Normally, most residential roofs are small enough to be covered by single length roof sheets – which are then lapped to form the shape of the roof. This normal lapping is called side lapping. And the edges of the roof sheeting are designed to be lapped. The roof sheeting has a special detail on the side ribs which reduces capillary action and also has a catchment lip to carry any water seepage along the edge of the roof sheet to the gutter. Unfortunately, when it becomes very difficult to cover a roof with full length sheets, a lateral (end) lap has to be introduced into the roof. This is where extreme care must be taken to lay the metal roof sheets in the right sequence and to seal the end lap correctly. …It may look easy to lay roof sheeting with end laps – but a correct sequence has to be observed or the end lap on the corrugated will start leaking just as described on my “Roof leaks in Sydney – caused by incorrect lapping of corrugated metal roof sheeting” blog. A lateral (transverse) lap joint on a metal roof. Generally, end lap joints should be avoided if it cannot be sealed properly. Sarking is generally used under roof tiles. It is a reflective and water resistant membrane that is installed under the timber tile battens. Sarking has reflective properties and this provides some insulation to the roof cavity. The other reason sarking is used is because tiled roofs let in some water during heavy rain. During these occasions, moisture is then caught on top of the sarking and it dribbles down and finds its way into the gutter. Sarking gets more important as the tile roof gets flatter 0r if there is a downpipe discharge on the roof. Tile manufacturers mandate the use of sarking on lower pitched roofs. Roof tiles get upgraded quite often and also manufacturers come and go. In Sydney, CSR Monier is the major tile manufacturer, followed by Boral tiles. So if you have a new roof and the roof tiler has not left you some spare roof tiles for your roof – then you should grab a tile off your roof one sunny day and head off to these companies to get some. Before they phase them out. For emergencies or if you can’t find a spare roof tile to fit, most roof tiles with simple cracks can be repaired using roofing silicone quite successfully. Terracotta roof tiles are baked from clay. The colour is either baked on or blended into the clay and baked. Concrete roof tiles are manufactured from sand and cement and the colour is painted on. Because of the manufacturing process and the raw material characteristics, terracotta roof tiles come in in more intricate designs and shapes – whilst concrete roof tiles are of simpler shapes. The paint on concrete roof tiles will fade and weather away over time – whilst terracotta roof tiles will keep their colour. Both concrete and terracotta roof tiles have limitations on how flat they can be laid. These limitations are more on the tile design rather than the tile material. Concrete roof tiles tend to be more resistant to breakage than terracotta roof tiles – although concrete roof tiles will generally chip more easily. Terracotta roof tiles generally have a more intricate interlocking lap and will not slide off even if they move off the roof batten. Concrete roof tiles can and slide off the roof if the holding hook moves off the roof batten. Salt water can cause terracotta roof tiles to ‘turn into powder’ (fret) whilst concrete roof tiles are generally immune. So water front homes fair better with concrete roof tiles. For those into roof repainting… concrete roof tiles can be repainted quite successfully to produce that new look – whilst terracotta roof tiles will resist the paint and cause paint peeling. For those into costs… concrete roof tiles are slightly cheaper to manufacture and to lay. So a concrete tiled roof will be found on most budget homes. Terracotta roofs have been around longer than concrete tiled roofs – so there are more terracotta roofs that are too old to repair than concrete tiled roofs. Generally, concrete gets stronger with age and even though the tile manufacturers give a 5o year warranty, you should expect a lot more. The older terracotta roof tiles tend to get brittle with age and these will break readily. The newer terracotta roof tiles do not have this tendency. Fretting (exact reasons not very clear) will shorten the life of terracotta roof tiles. As a general rule, you can safely say that a tile roof will last a life time…. In the roofing game, “Fretting” is a term describing a roof tile (mainly terracotta) decaying into powder. For some reason, the terracotta does not like salt (and some other corrosive chemicals) – and the tiles turn into powder. So, terracotta roofs near the sea coast tend to have more fretting problems – although I have seen fretting terracotta roofs in the western suburbs of Sydney. This means that there are other factors besides just salt that causes fretting. Besides salt spray near the coast, swimming pool heating elements on roofs can produce a salty environment that promotes fretting. Home owners with pool heating on their roofs (especially salt water pools) should check for leaks on a regular basis. I have seen very bad fretting under leaking pool heating. …Also, for more information and a video on fretting, go to my blog article about Fretting terracotta roof tiles in Sydney. There is a specific page on this website that goes to more detail about bedding and pointing. Take a look at this if you want more information. The best starting point is colorbond metal. Aluminium eaves gutters are not as sturdy – but they do not rust. Although they are more expensive that colorbond metal gutters. PVC gutters are much more flimsy and even thought they do not rust, they are not really a serviceable option. They break too easily. Copper guttering is expensive and does not have the range of colour finishes. 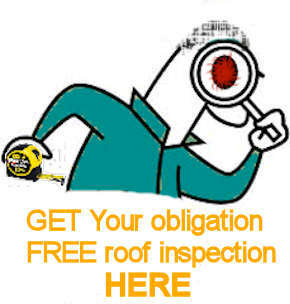 It can cause corrosion problems with other parts of the roof and it has good scrap vale for petty thieves. Stainless steel does not rust – but it is expensive. Corrosion against other roof elements can also be a problem. As for downpipes, painted PVC make a good option if a round downpipe is asked for. Otherwise, colorbond metal is probably the best option…. When a box gutter overflows – it is not good news. It means a lot of water very quickly and it also means interior flooding. It is essential to have large downpipes and overflows for box gutters – because you just do not want any sort of overflowing. Leaves and other debris (plastic bottles, paper and plastic wrapping) can block up the downpipes in a box gutter – so regular cleaning is necessary. The sizes of the downpipes and overflows are more important that the size of the box gutter – because it is about getting rid of the water quickly, not holding onto the water. A rainwater head is a box attached to the wall just below the discharge from a gutter. It catches the discharge and channels it into a downpipe which carries the rainwater to a ground connection. The main advantage in placing a rainwater head between the gutter and the downpipe is in the larger discharge capacity at the gutter. The full gutter can be dumped into the rainwater head and this means no gutter overflows. The rainwater head can be allowed to overflow externally to the building walls. Downpipes are usually done in colorbond finish for a longer life. Traditionally, downpipes are rectangular 100mm x 50mm – or the larger 100mm x 75mm. I prefer the larger downpipe because it empties the gutter much quicker and more efficiently. In most replacement situations however, the ground connection has been sized for a 100×50 downpipe – so the replacement will be the same size. Round 90mm diameter colorbond (or similar) downpipes are also a good alternative (especially in replacing the old 75mm diameter downpipes. It is a bit easier to do offsets and bends using the cast formed bends. Where the downpipe has to be run almost horizontal, PVC downpipes can be better because the joints can be sealed better than metal round downpipes. Whilst painting of timber work will protect it from rotting, the same cannot be said of painting roofs. Tile roofs do not rot in the weather and painting will not prolong its life. When metal roofs start rusting, paint will not stop it from rusting – it will only slow down the rusting for a while. Old metal roofs will rust from the top and bottom of the roof sheet and that is why trying to treat and paint just the top exposed side does not help much. Roof painting is very much just a cosmetic exercise. And I have seen many painted tiled roofs (especially terracotta) in Sydney ‘go wrong’. A lot is due to poor preparation. Then it is the choice of paint and how it is applied. Glazed terracotta roof tiles do not take well to paint and peeling happens fairly early. The costs involved to fix up the peeling and do a ‘respray’ (only to have it happen again) means that these roofs remain looking quite awful. Old concrete roof tiles can clean up quite well and painting these can be quite successful – but don’t believe the sales talk about old concrete tiles getting heavier and porous . There is very little truth in it. If you don’t like the colour of your old colorbond roof – then you can paint it quite successfully. Bluescope (the colorbond manufacturer) has a recommended procedure for painting colorbond roofs. However, Bluescope will not honour their warranty on a painted colorbond roof. Roof paint does not add any more strength to roof tiles or metal roofing and it does not stop rust that has already started. It does not change the porosity of roof tiles much. A well painted roof will look good for a while – but it will soon fade like the original roof did – so it may seem like painting makes your roof go longer. But functionally (keeping the water out), it makes no difference to the life of a roof. I do not clean or paint roofs. You would have gathered that I am not a fan of roof painting. So, I just choose not to do this. There are good reasons why people would like their roofs painted and there are plenty of roof painters who can provide them this service. I have a roofer friend who fixes tile roofs and also paints them. If you want roof painting, check out Bob the roofer…. Dome skylights come in a multitude of shapes, sizes and configurations. We often use the range from Regent skylights. Dome skylights can be quite a simple installation and it provides good natural light in corridors and rooms with little or no windows. Dome skylights on flat roofs demand special attention to proper flashings, whilst the steeper roofs make for easier installations. Dome skylights on metal roofs need less maintenance because there are no hidden flashings. Velux certainly makes a nice range of skylights – but they are ‘highly engineered’. This means a complex installation process that can easily go wrong. Factories use skylights to save on their electricity bills. 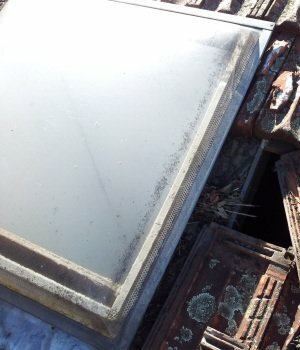 But factory skylights are not the same as typical domestic skylights. Instead, they use roof sheets made of fibreglass that are shaped just like the roof sheeting. Sometimes polycarbonate roof sheeting ( eg. Suntuf) is used. Sometimes, polycarbonate roof sheets can also be used in a domestic roof to form a skylight strip – much cheaper than a dome skylight. Whenever you put a hole on a roof to introduce a new element, it is a potential leak source – and skylights are no different. Skylights are one of the most common sources of roof leaks. A membrane roof is commonly needed on a flat concrete roof. A concrete slab may seem to be a strong barrier against water ingress, but this is not so. A bare concrete roof will leak because concrete shrinks over time and water travels through the shrinkage cracks. So, similar to a shower recess or an external balcony, a membrane is applied to flat concrete roofs to make it waterproof. When a membrane roof fails, you either get a membrane specialist to re-lay the membrane or try to repair it. There are some things on the roof that you can do yourself. There is a DIY tip for metal roofs on this page in the metal roof section…. Some people are quite handy and if you fall into this category and are looking for a tip on how to track down a leak on a concrete tiled roof where there is a solar hot water system…. then watch the video below to find out: Sorry video still to come…. Hi we have an existing tile roof and will be doing an extension – currently no sarking. I would like to replace the old roof then reroof the existing house plus new extension with colourbond. Do you do this sort of thing? We do a lot of colorbond roof replacements. It is now fashionable to replace the common tile roof with a modern looking metal colorbond roof. Send us an enquiry through the contact page. Appreciate your comment. It certainly makes my life easier when people can help themselves to all the helpful roofing hints here … rather than having to spend their time chasing me for information. Thanks very much for putting all of this information together. Even though I’m not actively looking for roofing services, this page is extremely helpful for learning the basics of roofs – what they’re made of, what types there are, what problems they can have, clear explanations of terminology… Champion work Jack, this is great stuff. Our roof in our gym is leaking during heavy rain . We need a solution ? Hello Jack, I am in an apartment with a concrete slab roof. It is possible to put in a light tube to bring some natural light into an otherwise windowless bathroom? These solartube and similar seem to require a minimum 15 degree angle. What are my options? 1) Ensuring that the structural purpose of the roof is not compromised. 2) Ensuring that the waterproofing of the flat concrete roof does not get compromised. For a small 300 to 400mm diameter hole, you can usually get away without affecting the structural strength of the roof. The main problem will be how to waterproof the hole. The usual solution is to build a hob around the hole and waterproof this to the slab. This HAS to be done properly to prevent water getting into your bathroom from the roof. Once this is done, you can put any type of skylight over the hob. The whole process involves three different trades. … a concrete cutter to do the hole. … a good waterproofer to do the hob and waterproof. … a good roofer to put in the skylight. When you are getting your gutters or roofing replaced, you should look into getting some high quality gutter mesh or gutter guards for a longer lasting guttering system. A lot of the time when gutters are overflowing, its important to always check the downpipes as these often get blocked easily by a tennis ball or other larger objects. Which french terracotta roof tile do you have in preference. I like Boral however i’ve noticed on newly installed roofs that the ends break easily and Monier marsielle terracotta roofs appear to be a little more heavier. I’ve tried to decide for couple of months now. There is not much difference between Monier ‘Marseilles’ and Boral ‘french’ terracotta roof tiles. The Boral tiles are slightly thinner and lighter … and this is why some tilers prefer them. They are also more consistent in size and shape – suffering less from ‘warping’ like the Monier Marseilles. I prefer the drainage design of the Boral french. You are right about the Monier tiles being a bit ‘chunkier’. It will all boil down to the colour that you want and also the tilers that you choose for the job (some prefer one over the other). Technically, they both do the same job. I have a home 12 years old . It has a colour bond roof and the heads of the fastener screws are rusting. I would estimate 70% of the fasteners are showing rust . Can you please advise if this is normal, I would have thought they should last longer than 12 years. To me looking at the the screws the ones that are not rusting are galvanised with some roof colour paint on them. I have been to the home builder with out any success, and would like your thoughts. Unless you are close to a marine environment, you should not see any rusting roof screws (if they are class 3 or class 4) on a 12 year old roof. It is not a major concern now since it should not affect your roof sheeting much. Long term, it is quite simple to swap the fasteners over with new fasteners. We have a new home which we have been in for 12 months. The roof is a colour bond roof jasper in colour. We have never been happy with the amount of marks on the roof after it was installed. Now it has gone all black and you can visibly see the dirt and grime all over the roof. I have looked at other homes around us that are both the same age and have the same colour or lighter and none of them show the deterioration ours has shown in just over 12 months. Can you give us some advice or what can be done to clean the roof. Colorbond roofs are supposed to ‘self-clean’ – by normal rainfall. I can only guess that the roofer has used spray paint touch up on the scratches. The touch up paint fades differently to the colorbond and that may account for the ‘dirty’ look. A good local high pressure clean will reveal what the problem is. Hi Jack, My husband is replacing our deck awning and has come across a problem- hope you don’t mind if I ask for your help. The existing corrugated iron roof( approx 25 yrs old. We believe it is colourbond) and the new corrugation for the deck do not match. The new sheeting has a depth of 16mm and the old 14mm. We have tried screwing it down to flatten it thinking that over a large expanse it would match but this is not the case. Were there different specifications to colourbond around the time the old roof was installed? Is there any way to match it or will we have to replace the entire roof to match the awning. In my experience, the standard ‘corrugated’ profile (roll height = 16mm) has not changed since day one. The new and old match. The corrugated sheets that are used for bullnose and curving work are of a heavier grade and slightly higher roll height of 17mm. Perhaps your husband has purchased curving grade corrugated roofing for the new awning? Or the awning is a curved roof? If this is the case, then you will have to replace the old roof with curving grade corrugated sheets – if you want an exact match. 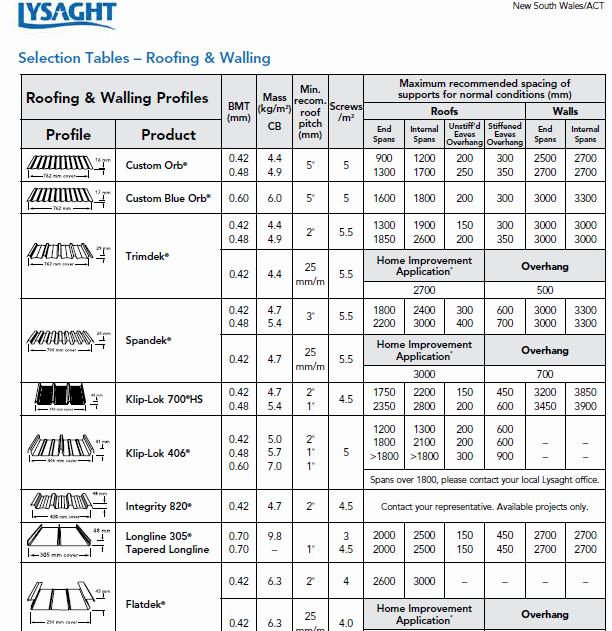 Lysaght has recently introduced a ‘high roll’corrugated roof. Custom orb21 has a 21mm roll height and custom orb35 has a 35mm roll height. From what you tell me, it is unlikely that your new awning roof is custom orb21…. In relation to valley iron, would you recommend to use the Ace gutter colourbond rollform valley iron or the zincalume ones the Ace product. I have searched them up and it appears that zincalume comes with silver colour, and both have great coating, will last for years and do not rust. Is that correct? Which one would you prefer and why? In addition, the gutters tend to overflow every time it rains. Would installing rainwater heads solve the problem? If so, do I need to install rainwater head to every down pipe? Otherwise, would one or two be enough? Roughly how much will it cost to install (labor plus material)? I would use the ACE ‘colorbond’ roll form because it is the ‘zincalume’ valley which gets a couple of coats of factory applied paint (making it more durable)… and it adds very little to the cost of the valley work. Rain water heads may help against overflows if the ends of the gutter are left open and they discharge directly into the rain water heads. You should get a roofer out to see why the gutters overflow that much… and he/she should be able to tell you what the problem is and id rain water heads will help. The roofer will also be able to quote you for it. I would like to view a video on how to install Colorbond corrugated bullnose roofing sheets on my verandah. I have the sheeting. 7 metres wide x 1.8 metres deep with a hip on one end. 6 metres off the ground. I am trying to work out where start and finish. Start at the hip or the building side wall and work toward the hip.